"Many scientists who testify in court are disappointed by the experience, perhaps this is because their experience demonstrates that the legal system cannot attain the same goal as the scientific method." (Bair, 2001) (Acrobat (PDF) 4MB Jun18 09). Science works with well-defined research questions, observations, testing and re-testing of hypotheses, and peer review of results. When scientific studies are at the heart of lawsuits, science and law converge, and often conflict. Conflicts emerge as the scientific method is portrayed to jurors, the background, credibility, methods, and analysis of scientific experts is questioned on cross examination, and scientific terms are used in a legal context. Often jurors are swayed during testimony by the personalities of the experts more so than by the facts and opinions that the experts present. 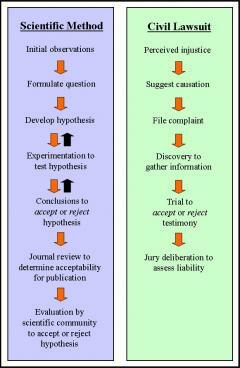 Flowcharts illustrating the differences between the scientific process and a trial process. Scientists need to recognize that the legal system functions differently from scientific investigations. The legal system is designed to resolve conflicts and, as a result, may be less concerned about identifying an underlying or global truth, as it is framed in the scientific process (Hughes 1999 ). In many ways the scientific method and the path of a lawsuit through the U.S. legal system are similar. The scientific method is an informal set of rules for formulating concepts, conducting experiments, making observations, developing inferences, and testing the inferences by experimentation and observation. The results are then submitted to a research journal where editors and other scientists scrutinize the material and judge it acceptable or unacceptable for publication. If published, the scientific community evaluates the study and additional studies either confirm or reject the findings of the original study (Bair, 2001) (Acrobat (PDF) 4MB Jun18 09). In a civil lawsuit, a perceived injustice leads to identification of possible causes and filing of a legal complaint. The parties then discover the evidence to support and refute the complaint. A trial is held either before a jury or a before judge to evaluate the evidence and make a judgment as to liability (Bair and Metheny 2002 ). A jury bases its verdict on the evidence presented in court. In a civil case, for the jury to decide in favor of the plaintiff, a majority of the evidence (at least 51%) must indicate that the defendant is liable This standard is much lower than the typical acceptability, for example, of a computer model of a groundwater flow system (Bair, 2001) (Acrobat (PDF) 4MB Jun18 09). This lower standard may offer room for creativity from some experts to present analyzes and opinions that show favorable results for their client's case. This may be used for numerous reasons such as: different scientific approaches to analysis, prohibitive costs, and a legal strategy that calls for a simplified analysis. Also, a simplified approach may be more understandable to jurors than a complex arcane analysis. On the other hand, a simplified analysis can be good fodder for cross examination. As the reliance on specialized knowledge has increased in our society, so has the use of expert witnesses in court cases. Some authors argue that expert witnesses are proliferating the presentation of junk science in the courtroom. These "experts" are portrayed as mercenaries that will testify to any theory, for a price, in an attempt to win sympathy from a jury selected from a techno-terrified society (Huber 1990 , Huber 1993 , Jost 1991 ). This problem is exacerbated by judges and lawyers who are not adequately trained to assess the scientific evidence before them (Blauvelt 1999 ). The Woburn case hinged on the application and understanding of several scientific issues. In the first phase of the trial, the jury was asked to determine if toxic chemicals from two companies polluted two municipal wells. If the jury found either defendant liable, then, in the second phase, it would have to determine whether the cluster of childhood leukemia cases was caused by prolonged consumption of the polluted water. Scientific studies were commissioned by the attorneys involved in the case. IN the first phase of the trial, the expert witnesses, using the same sets of data shared during trial discovery, presented divergent opinions. One of the important learning goals in a mock trial relates to students understanding of the scientific method and how it is applied to seeking truth in science and resolving conflict in a trial. Early in the learning modules, students are made aware of the importance of teaching and educating the jury about the technical and scientific issues, concepts, and principals involved in the trial, remembering that the jury is selected from a pool of lay persons. (Bair, 2001) (Acrobat (PDF) 4MB Jun18 09), "Models in the Courtroom" in Anderson, M.G. and P.D. Bates (eds) Model Vaildation: Perspectives in Hydrological Science, John Wiley & Sons, Ltd.
How could three hydrogeologists looking at the same sets of data come up with vastly different conclusions? What is the role of an expert witness -- to dispassionately present opinions or to be a scientific advocate for the client? What role does cross examination play in court?